FlickrSync is an Open Source file synchronization software that synchronizes photos with the popular photo hosting site Flickr. It has to be authorized for communication with Flickr on first run on the Flickr homepage but runs independently from the photo hosting site afterwards. 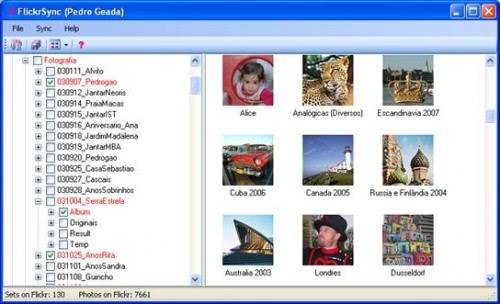 The interface consists of a basic folder browser which can be used to select folders to be synchronized with Flickr. The selection of a folder will open a properties dialog that contains several configuration options for the synchronization. This includes a title and description for that folder on Flickr, permission settings (public, private, only friends, only family, friends and family), a matching method (what to do if images already exist on Flickr), order and filters. A click on the View and Sync all button will process all folders that have been selected for synchronization and display new images in a preview window. A click on the sync button in the preview window will start the file synchronization process that transfers the files to Flickr. It is also possible to right-click a folder and synchronize its contents (and the contents of its subfolder if selected). FlickrSync can be run automatically from the command line after the first configuration. This process requires no user interaction which makes it a great way to synchronize photos with Flickr on a regular basis, e.g. during system startup or after moving photos from a digital camera to the computer system. The file synchronization software FlickrSync supports all Flickr image formats. It is compatible with computer systems running Windows XP or later Microsoft operating systems.